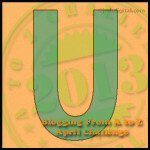 This is my 21st post for the April A-Z Challenge. 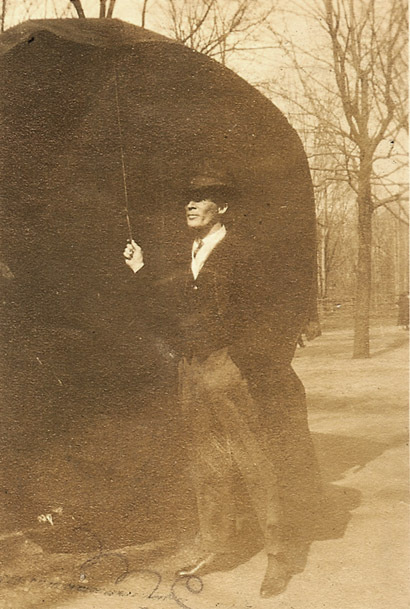 Featuring a photograph from 1918 of my grandfather Mershell C. Graham with a huge umbrella. I used this photo in 2011 for a Sepia Saturday post. There are several others that go with it. If you want to see them go here – Poppy Was Cool. I think that for my next A-Z challenge I will use all family photographs that go with the letter, minus much writing. This is really wearing me out! Hard to believe there are only 5 left. He could easily been on the cover of GQ. Confidence surrounds him. I never thought of Poppy as cool when I was growing up, but cool was obviously in him. Hard to tell where the umbrella ends and he starts! Wonder what the story is behind the pic. Kristin, as you know there’s nothing quite like the swag of the men in our families!! I did a story on my dad being a man of style last year featuring him in his fedora hats. The minute I saw this photo of your grandfather looking as “smooth” as he wanna be, I couldn’t help but smile. Your grandfather looks handsome and I like the way he knows it too — LOL! I have truly enjoyed your April A-Z features! Thanks, Liv. I know what you mean. It’s funny but my grandkids will never see my husband like I do, unless they find a photo of him looking cool years from now. What a very cool picture! Stylish, dapper and cool. That just about wraps it up. Damn, he was one classy looking guy. And that is the biggest umbrella I have ever seen! Me too. I wonder what it was for. Yes, that is one big umbrella. It almost looks as if he could take off with it! As I look at it this morning, I wonder if it was a regular umbrella with a blanket or piece of fabric over it. Wow. Huge umbrella! And what a handsome man.